The shamisen is a plucked stringed instrument. Its construction follows a model similar to that of a guitar or a banjo, with a neck and strings stretched across a resonating body. The neck of the shamisen is fretless and slimmer than that of a guitar or banjo. The body, called the dō (胴), resembles a drum, having a hollow body that is covered front and back with skin, in the manner of a banjo. The skin used depends on the genre of music and the skill of the player. Traditionally skins were made using dog or cat skin but use of these skins gradually fell out of favor starting around 2006 due to social stigma and the decline of workers skilled in preparing these particular skins. Contemporary shamisen skins are often prepared with synthetic materials, such as plastic. The sao (棹), or neck of the shamisen is usually divided into three or four pieces that fit and lock together. Indeed, most shamisen are made so that they can be easily disassembled and stowed to save space. 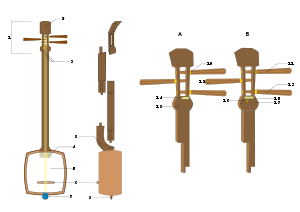 The neck of the shamisen is a singular rod that crosses the drum-like body of the instrument, partially protruding at the other side of the body and there acting as an anchor for the strings. The pegs used to wind the strings are long, thin and hexagonal in shape. They were traditionally fashioned out of ivory, but as it has become a rare resource, they have been recently fashioned out of other materials, such as various kinds of wood and plastic. The three strings are traditionally made of silk, or, more recently, nylon. They are stretched between the pegs at the head of the instrument, and a cloth tailpiece anchored at the end of the rod which protrudes on the other side of the body. The strings are stretched across the dō, raised from it by means of a bridge, or koma (駒), which rests directly on the taut skin. The lowest string is purposefully laid lower at the nut of the instrument, so that it buzzes, creating a characteristic timbre known as sawari (somewhat reminiscent of the "buzzing" of a sitar, which is called jivari). The upper side of the dō (when on the player's lap) is almost always protected by a cover known as a dō kake, and players often wear a little band of cloth on their left hand to facilitate sliding up and down the neck, known as a yubikake. The head of the instrument known as a tenjin may also be protected by a cover. The material of the strings will depend on the skill of the player. Traditionally, silk strings are used. However, silk breaks easily over a short time, so this is reserved for professional performances. Students often use nylon or 'tetron' strings, which last longer than silk, and are also less expensive. The construction of the shamisen varies in shape and size, depending on the genre in which it is used. The bachi used will also be different according to genre, if it is used at all. Shamisen are classified according to size and genre. There are three basic sizes; hosozao, chuzao and futozao. 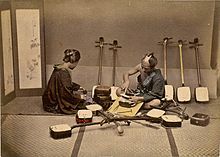 Examples of shamisen genres include nagauta, jiuta, min'yo, kouta, hauta, shinnai, tokiwazu, kiyomoto, gidayu and tsugaru. The hosozao (細棹, literally "thin neck"), as its Japanese name implies, is the smallest kind of shamisen. The body is small and particularly square-shaped, with a particularly thin neck, which tapers away from the strings just as it approaches the body. Generally, the hosozao is used in nagauta, the shorter and thinner neck facilitating the agile and virtuosic requirements of Kabuki. Hosozao shamisen especially built for nagauta ensembles are often simply known as a "nagauta shamisen." The hosozao is also often used in kouta (geisha music), where it is plucked with the fingernails. The chuzao (中棹, literally "middle neck") is a size up from the hosozao. As its name implies, the neck is slightly thicker. As the neck approaches the body of the instrument, the distance between the strings and the fingerboard is maintained, unlike the hosozao, where it tapers off. The fingerboard ends abruptly, and the rest of the neck curves sharply into the body of the instrument. The pronounced curve that occurs just before the neck meets the body is called hatomune (鳩胸, literally "pigeon's breast"). The result is an extended fingerboard that gives the chuzao a higher register than the hosozao. The chuzao is favored for jiuta style playing, with a broader, more mellow timbre. It is also an "all-round" instrument that can actually be used across many genres. Finally, futozao (太棹, literally "fat neck") are used in the robust music of gidayubushi (the music of bunraku), Joruri Min'yo, and Tsugaru-jamisen. In these genres, a thicker neck facilitates the greater force used in playing the music of these styles. The futozao of Tsugaru-jamisen is quite a recent innovation, and is purposefully constructed in a much larger size than traditional style shamisens, and its neck is much longer and thicker than the traditional nagauta or jiuta shamisens. The bachi (撥) or plectrum used to play the shamisen also differ in size, shape, and material from genre to genre. The bachi used for nagauta shamisen are made out of three possible materials, i.e. wood, plastic, or ivory. While many nagauta teachers do not approve of the use of plastic, if ivory is unattainable and wood is still out of price range, plastic will suffice. Jiuta bachi are made entirely out of plastic or ivory, or plastic and tortoiseshell (bekko), or ivory and tortoiseshell. Jiuta bachi are the easiest identified because they are the longest, the widest and also have a deep indentation where the tortoiseshell meets the handle. There are sometimes also jiuta bachi that are made with a buffalo horn handle. The material however makes no difference in the sound. Gidayu shamisen uses the heaviest and thickest bachi, which however is not as wide as a nagauta bachi. The bachi used for tsugaru-jamisen is the smallest. It is almost always tipped with tortoiseshell. The koma (駒), or bridge, can be fashioned out of aged bamboo, ivory, ox-bone (shari), rosewood, buffalo horn, kōki wood, any combination of the above, or plastic for the student level. Koma come in many heights. The higher the koma, the louder the sound will be, and the harder it is to control a rapid "sukui". The higher koma are not suitable for beginners. Koma for nagauta are fashioned out of only three materials, i.e. ivory, bone, and plastic. Ivory is the most expensive and produces the most desirable sound and amplification, but due to its high price tag is normally only used in performances. Ox-Bone or shari is the most popular koma for practice and with students who are performing. Because of ivory's volume and vibration it is normally used by a teacher or tate-jamisen (lead shamisen), so that the other players can follow their tone and signals. Plastic is becoming increasingly harder to find simply because it does not produce a desirable sound when compared to shari koma. Shari is not much more expensive than plastic, and most teachers openly express their displeasure with plastic koma and require shari. Koma for jiuta are made out of a few select materials, i.e. yellow or black water buffalo horn (suigyu) are the standard for jiuta. Blackwater buffalo horn does not have a significant sound difference when cut in the "jiuta koma" style, and is far less popular. Yellow suigyu is the most widely used for jiuta style shamisen, both in practice and performance. Plastic is available because of the higher price tag of suigyu. Many people believe that for jiuta, there is not a great sound difference between the two, but there is a high change in vibration. Plastic makes a deader sound, which is not the most favorable for jiuta. Shari is used from time to time in practice, but never for jiuta performances. Tsugaru koma are very easily identifiable due to their unique structure and use of two different materials. Tsugaru koma are very thin in width, and are not very high. The base is usually made of either bamboo, smoked bamboo, or a wood of some kind, while the top half in which the strings pass through can be made of ivory, bone, or tortoiseshell. Because of the thickness of both the strings and neck of the futozao shamisen, the Tsugaru bridge in general tends to be longer than the others. One should not confuse a gidayu (highest koma made, fashioned out of black buffalo horn) or kiyomoto koma (looks exactly like nagauta koma but is much wider at the base) with a Tsugaru. Shamisen used for traditional genres of Japanese music, such as jiuta, kouta, and nagauta, adhere to very strict standards. Purists of these genres demand that the shamisens be made of the correct wood, the correct skin, and are played with the correct bachi. There is little room for variation. The tsugaru-jamisen, on the other hand, has lent itself to modern use, and is used in modern genres such as jazz and rock. As a more open instrument, variations of it exist for show. The tuning pegs, which are usually fashioned out of ivory, and bachi which are fashioned from a combination of ivory and tortoise-shell for example, are sometimes made of acrylic material to give the shamisen a more modern, flashy look. Recently, avant-garde inventors have developed a tsugaru-jamisen with electric pickups to be used with amplifiers, like the electric guitar: the electric tsugaru-jamisen has been born. The Heike (平家) shamisen is a shamisen particularly fashioned for the performance of the song Heike Ondo, a folk tune originating from Shimonoseki, Yamaguchi Prefecture. The neck of the Heike shamisen is about half the length of most shamisen, giving the instrument the high range needed to play Heike Ondo. The use of more typical shamisen is possible, but they must be properly adjusted with a capo device to raise their pitch to make them suitable for use. Today the strings are made out of steel to make a better sound and the drum heads are made out of plastic to avoid breakage in a performance. In most genres the shamisen strings are plucked with a bachi. The sound of a shamisen is similar in some respects to that of the American banjo, in that the drum-like dō, amplifies the sound of the strings. As in the clawhammer style of American banjo playing, the bachi is often used to strike both string and skin, creating a highly percussive sound. In kouta (小唄, literally "small song") style shamisen, and occasionally in other genres, the shamisen is plucked with the fingers. 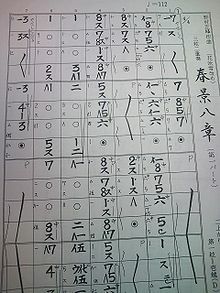 Music for the shamisen can be written in Western music notation, but is more often written in tablature notation. While tunings might be similar across genres, the way in which the nodes on the neck of the instrument (called tsubo (壷) in Japanese) are named is not. As a consequence, tablature for each genre is written differently. For example, in min'yo style shamisen, nodes on the shamisen are labeled from 0, the open string called "0". However, in jiuta style shamisen, nodes are subdivided and named by octave, with "1" being the open string and first note in an octave, starting over at the next octave. The nodes are also labeled differently for Tsugaru style shamisen. To add to the confusion, sometimes nodes can be "sharped," and since the names of nodes and their positions are different for each genre, these will also vary. Consequently, students of one genre of shamisen will find it difficult to read tablature from other genres of shamisen, unless they are specially trained to read these kinds of tablatures. The Japanese shamisen originated from the Chinese instrument sanxian (Chinese: 三弦). The sanxian was introduced through the Ryūkyū Kingdom (Okinawa) in the 16th century, where it developed into the Okinawan instrument sanshin (三線) from which the shamisen ultimately derives. It is believed that the ancestor of the shamisen was introduced in the 16th century through the port city of Sakai, near Osaka. One contemporary shamisen player, Takeharu Kunimoto (1960-2015), played bluegrass music on the shamisen, having spent a year studying bluegrass at East Tennessee State University and performing with a bluegrass band based there. Another player using the Tsugaru-jamisen in non-traditional genres is Michihiro Sato, who plays free improvisation on the instrument. Takeshi Terauchi & Bunnys utilized shamisen played by Michiya Mihashi in combo with their instrumental rock group on their single "Tsugaru Jongara Bushi" with "Dark Eyes". Japanese rock musician Miyavi has also played the shamisen on various occasions, incorporating its use in albums and during concerts (e.g. during the debut live of superband S.K.I.N concert at the 2007 Anime Expo convention at Long Beach, California on June 29, 2007). Japanese folk rock/metal band Wagakki Band takes several different traditional Japanese instruments and combines them with Western Rock and Vocaloid songs. One of their members, Beni Ninagawa, plays a tsugaru shamisen on albums and during concerts. The shamisen is also used in the music of pop speed metal band Babymetal; it can be seen in their music videos and is played live onstage. A magical shamisen is featured in the 2016 movie Kubo and the Two Strings. In the movie, the main character (Kubo) uses its power to defeat his enemies and complete his quest. The instrument is featured in Regina Spektor's cover of "While My Guitar Gently Weeps," which plays over the end credits and is included on the film's soundtrack. ^ "110mb.com - Want to start a website?". Retrieved 28 February 2015. ^ Alves, William (2013). Music of the peoples of the world (3rd ed.). Boston, MA: Schirmer, Cengage Learning. p. 320. ISBN 1133307949. ^ Hueston, Dave (29 December 2016). "Shamisen faces crisis as cat skins fall from favor". The Japan Times. Retrieved 20 May 2017. ^ Miki, Minoru (2008). Flavin, Philip, ed. Composing for Japanese instruments. Rochester, NY: University of Rochester Press. p. 89. ISBN 1580462731. ^ a b Leiter, Samuel L. (2007). Encyclopedia of Asian Theatre: A-N. Greenwood Press. p. 445. ISBN 978-0-313-33530-3. ^ a b Kodansha encyclopedia of Japan, Volume 7. 1983. p. 77. ISBN 978-0-87011-627-8. ^ a b c Malm, William P. (2000). Traditional Japanese music and musical instruments, Volume 1. Kodansha International. p. 213. ISBN 978-4-7700-2395-7. ^ a b Picken, Laurence E. R. (2006). Music from the Tang Court: Some Ancient Connections Explored, Volume 7. Cambridge: Cambridge University Press. pp. 33–34. ISBN 978-0-521-54336-1. ^ "YouTube". Retrieved 28 February 2015. ^ "Zenithrash -THE SAMURAI METAL- - Listen and Stream Free Music, Albums, New Releases, Photos, Videos". ^ "S.K.I.N. debut concert live report at JAME". Archived from the original on 2008-06-13. ^ "Q&A: God of Shamisen". 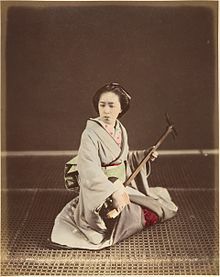 Wikimedia Commons has media related to Shamisen.